Cymre Brightblade is an archaeologist investigating a ruin in southern Gorgrond. Her battle pets are a sentient artifact, a magical lantern, and a dapper little mechanical who helps run the operation. 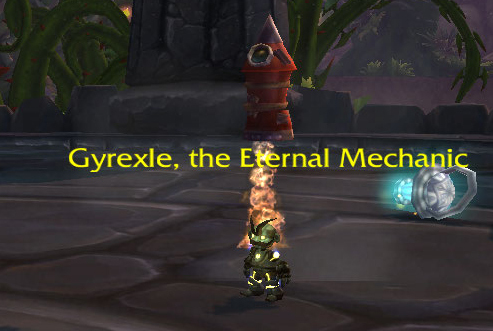 Cymre’s name is a tribute to Cymre Jones, a battle pet and archaeology blogger over at Bubbles Of Mischief. 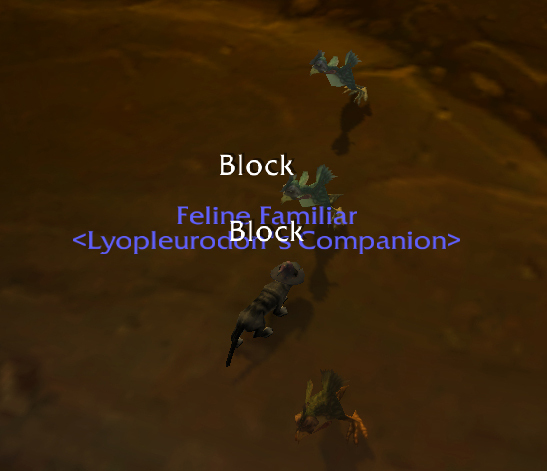 This fight is the most challenging of all the independent Tamers on Draenor. So much so that, between design iteration, RNG & being strapped for time, I’ve sadly only managed to formulate a non-carry strategy. 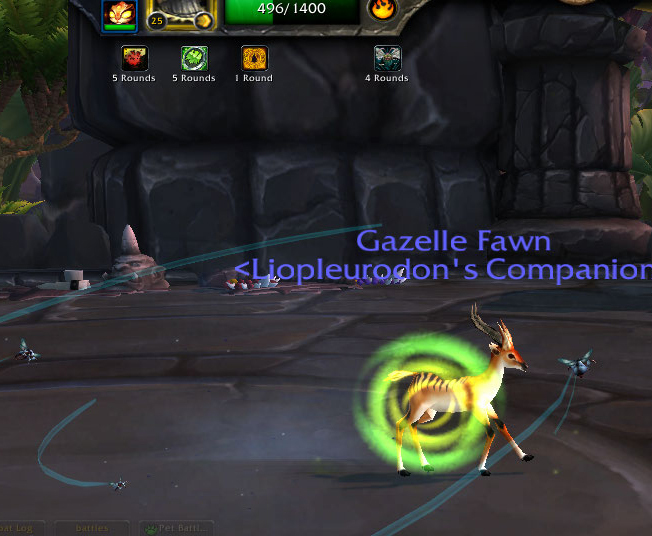 The Gazelle Fawn has a specific move which is fairly crucial to defeating this tamer. The only other pet I’d recommend (other than the other fawns, sheep, etc with this moveset) is the Teroclaw Hatchling, which is brand new for Draenor and easily obtained, but starts Uncommon and at level 1. The Dark Whelpling is pretty much the ideal pet for this situation (given the difficulty of this fight, that’s what I’d recommend here if you’re trying for a 2-pet carry). The Scourged Whelpling is your next best bet. The Infinite Whelpling (don’t use the Sleep ability!) or the Death Talon Whelpguard are decent choices, but require more thorough cooldown monitoring. To be completely frank, I can pull off a 2-pet strategy roughly half the time with this ideal setup. 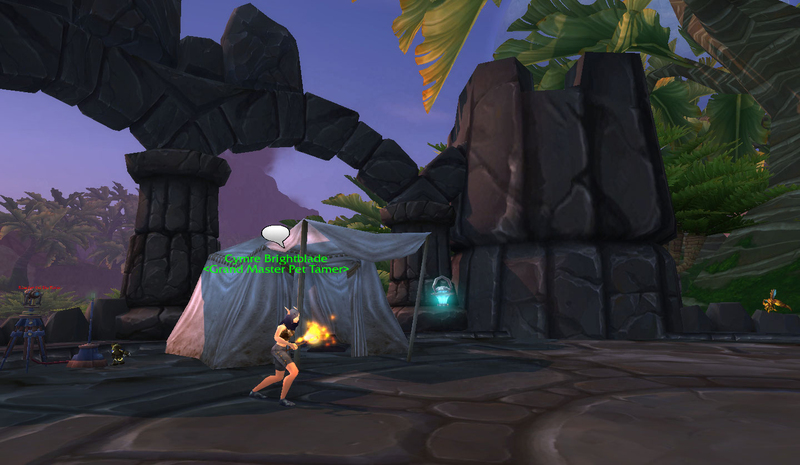 Rather than beat my head against it and get needlessly frustrated, unless I’m trying for something specific like the Awfully Big Adventure, I opt to put in the Pandaren Fire Spirit over trying a leveling carry. Molten Wave makes Cymre’s last battle pet relatively trivial, and the Cauterize heal is really nice too. The Lava Crab is similar and easier for a novice to obtain, but I just happened to pull the Fire Spirit first. Whether or not I can pull off a carry depends extremely heavily on what Cymre’s first pet does. It is a doozy. The only offense Idol of Decay has to speak of is Swarm Of Flies, which is going to be trivial against our critter. Or is it, lololol. 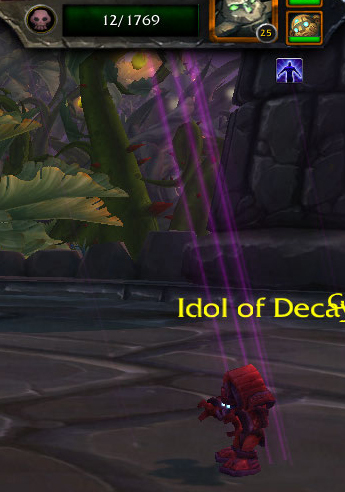 Idol of Decay is a huge troll, and will cast Rot, making your pet suddenly vulnerable. This is why that Gazelle Fawn is so crucial. It can use Nature’s Ward and bust that Swarm Of Flies damage back down to size again, while healing itself back up. It’s a pretty neat trick, but Idol of Decay still has one more of its own up its sleeve. It uses Dark Rebirth which means you basically have to beat him a second time, but ONLY IF it dies (permanently, as it is also Undead). This ability, whether it’s used at a time when I can wait, whether I wait through several turns and he doesn’t use it, etc, makes or breaks whether or not the carry is viable. If he succeeds in getting off the Rebirth and I’m attempting a carry, I just abandon it and restart because my outcome is not going to be positive. Cymre’s second pet uses Sunlight and Wish, which is why I favor the Dark Whelpling. Switching that Sunlight to Darkness helps matters immensely. The heal-halving power of Darkflame does quite a bit, but won’t reverse the additional heal that Sunlight brings to the table. Of course, the Wishbright Lantern also uses Arcane Blast, which hurts more each time it’s cast. Even with the change to Tail Sweep which now causes you to usually bottom out on the Wishbright’s Magic family ability, it’s still advantageous to pick it anyway. It will still have more throughput on your third pet. Gyrexle’s main offense is Build Rocket, which is why I like using Magma Wave. He has Railgun, but doesn’t use it all too frequently. Between Magma Waves and Cauterize, once you can get your Fire Spirit in this fight is over. Gyrexle will occasionally Repair, which can be an issue if you left Sunlight active, but your Fire Spirit (or Lava Crab) will benefit from that, too. Like I said, it’s definitely a doozy of a fight. You can still use those pet charms to gain a level or 2, at least. This entry was posted in strategy, tamers, Uncategorized and tagged strategy, Warlords of Draenor on November 3, 2014 by Liopleurodon. 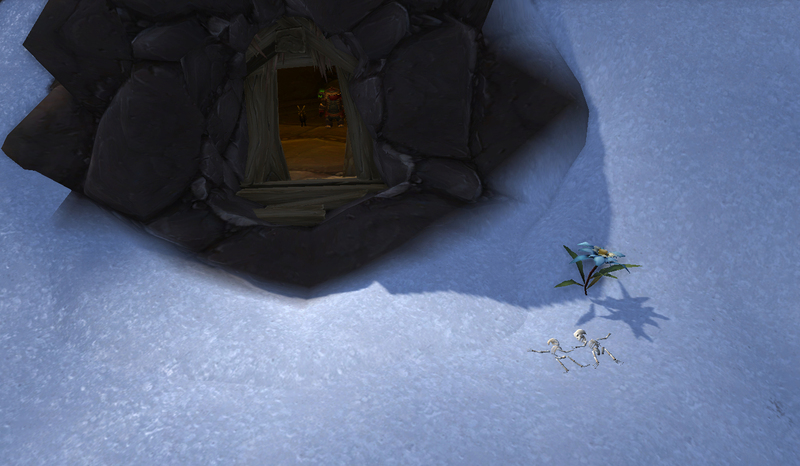 In the snowy wastes of Frostfire Ridge, you’re going to see many adorable little Frostwolf pups. 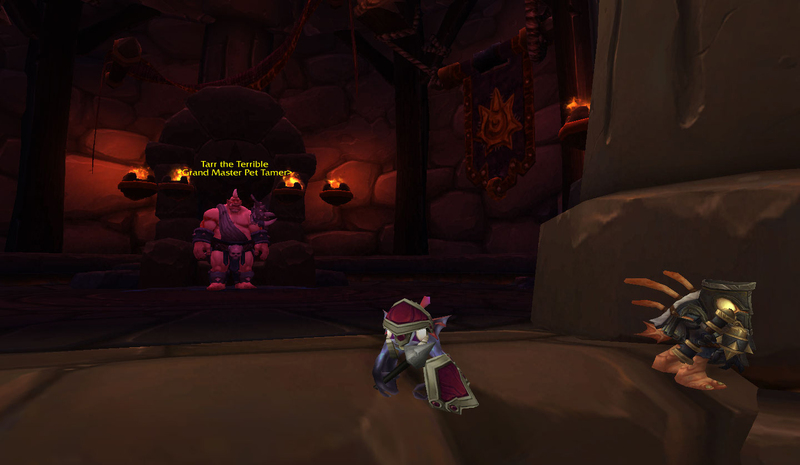 While their older counterparts are seen as companions by the Frostwolf, there aren’t many people who want to snuggle these tiny balls of fluff so hard their bitty eyes pop like I do. But, there is one Orc. 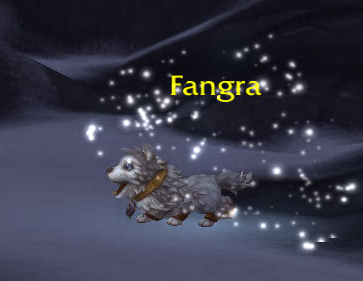 Gargra, the pet tamer in Frostfire Ridge, has 3 of the cutest pups to enter WoW to date by her side. Because I can’t get one myself until I unlock a rep and grind a ton of crystals, let’s take her down a peg, shall we? The first battle pet I’m using is a bit of a rare one. I like the Yeti specifically because it pairs Call Lightning with Ion Cannon, which is an incredibly powerful match ender. There is no other battle pet with these 2 moves, unfortunately. I’ve had success with a few other pets with Call Lightning, though you may want to use a higher-level carry here just to ensure a win. The Skywisp Moth in particular is an excellent partner here because almost all the offensive damage here is Beast, but it’s a bit dependent on RNG. If you hit Slicing Wind 1 time a lot, you’re going to be in trouble. Lil Bling has a powerful Mechanical DoT and the damage reducer Extra Plating, plus Inflation which both applies Shattered Defenses and is a strong DoT. I’m finding Lil Bling to be indispensable as we go through Draenor. I’d really suggest you grab one if at all possible. On most Auction Houses they’re under 2K gold just now, though you will have to stone & level it from scratch. 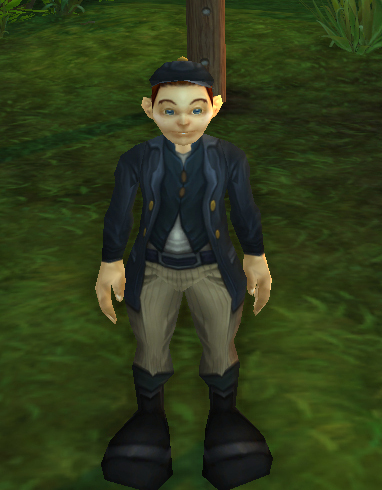 An alternate is maybe the Clockwork Gnome, but the turret lacks a lot when weighed against the power of Inflation. This specific strat is a two-pet Elekk Carry, but it can also be a level One carry. 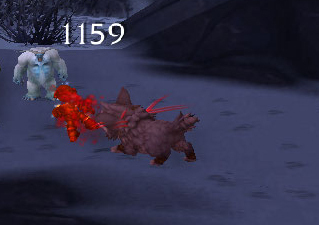 The first of Gargra’s itty bitty frostwolves has the damage buffer Prowl, which it usually uses as a lead-in for Call The Pack. I usually try to leave in the Yeti at that point, even after I cast Call Lightning, and then swap to Lil Bling after Call The Pack. 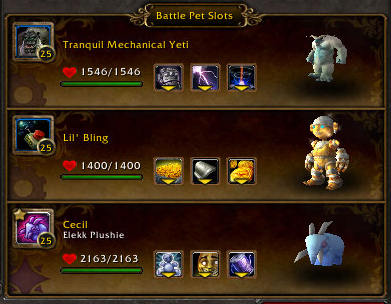 If I’m using a higher level carry pet or for the Elekk Carry I’ll sometimes try to soak this damage since it’s a pretty big hit but in any case, after that Prowl turn it’s Lil Bling’s turn to enter. The interaction between Call Lightning and Lil Bling’s Inflation is our workhorse this fight. Inflation does several hits, meaning that Call Lightning’s sort-of DoT hits many times, but then after Shattered Defenses is applied each hit of Call Lightning will also double. It’s pretty sweet, and will make this fight pretty trivial. Except for one thing. Gargra’s second wolf, Fangra, is an evasion machine. She’ll boost everyone’s speed with Dazzling Dance & then immediately use Dodge to avoid your attacks for 2 turns, meaning that, if you use your Inflation through it, Shattered Defenses will fall off before you can attack her again. You should use these turns on Extra Plating & re-applying the Make It Rain DoT. Even if you’re not carrying a pet, you want to swap whatever pet took Shattered Defenses out if at all possible. Luckily at this point, if you’re using the Yeti the fight is a lock. Ion Cannon will absolutely destroy that last pet, though to make sure it’s a lock, you’ll want to make sure that last pet is within 900 HP or so. I usually sneak in one last Call Lightning here & then, bam. If you’re using a different pet you obviously need to be a lot less careless than that, plan your moves & avoids & whatnot, but dang those big numbers are just so, so pretty aren’t they. This entry was posted in strategy, tamers and tagged Grand Master Tamer, strategy, Warlords of Draenor on October 28, 2014 by Liopleurodon. Tarr is an ogre after my own heart. He’s hanging out in New Nagrand by the Ring Of Blood, which features a whole bunch of Ogres thirsty for each others’ blood. They’re all locked in gladiatorial combat, vying for Best PVP Ogre NA 2014, while Tarr is busy training up his battle pets. I can relate, Tarr honey, but I’m still going to ruin your day. As a constant for tamer fights, Cecil The Elekk Plushie is on the team. For this fight, dealing Undead damage is the way to do it. Because of the swaps Tarr makes, and because I just gotta do me, I enjoy a DoT-heavy moveset, specifically involving Curse of Doom. The real MVP on this team is the Bone Spider. The force swap mechanic and DoT moveset on this spider combine with deadly results. You can do something similar with a pet with a dodge, like the Restless Shadeling. A Crawling Claw is probably preferable to the Lost Of Lordaeron, but the latter is found in the Undercity and the former is just… don’t even talk to me about Tol’vir archaeology combines. 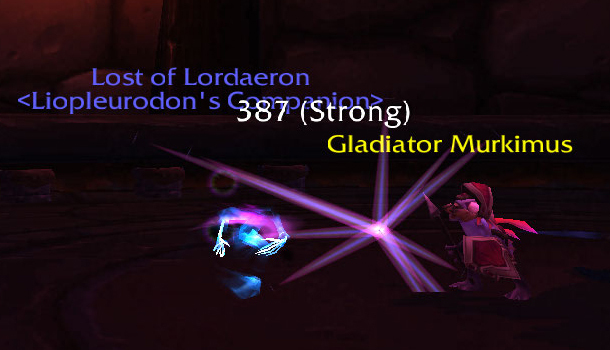 I do like to make sure the Curse of Doom pet has a straightforward Undead damage dealing ability, like the Lost Of Lordaeron’s Shadow Slash, so keep that in mind if you’re swapping for, say, the Creepy Crate. For the purposes of an Elekk Carry it doesn’t matter too terribly much because your Elekk can just run out the clock while you wait for DoTs to tick, but not so much for a typical two-pet carry. Tarr’s team in general is a little gimmick-laden. He’s one of the few tamers who makes a lot of swaps, and that’s largely because of his first pet’s Falling Murloc ability, which causes damage and a self-stun. 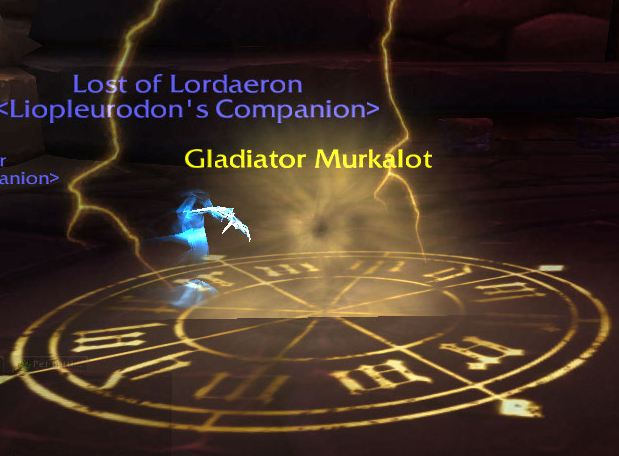 Tarr will always swap to a different pet when Gladiator Murkalot is stunned, so I like to lead off with that Lost of Lordaeron & a Curse of Doom, then swap off to the Bone Spider. The Bone Spider is excellent here because it’s extremely speedy. Gladiator Deathy uses a stun and then will charge up his Deep Breath during the stunned turn. As a result, the Bone Spider is un-stunned by the round Deathy unleashes that Deep Breath, but will go first on that next turn. By using your Force Swap, it essentially interrupts Deathy so you don’t take that rather considerable damage. An alternate tactic is to use a pet like the Restless Shadeling with a dodge (Phase Shift), though in this case you want your pet to be faster than Deathy to ensure you get your dodge off before Deep Breath pops. The other super annoying thing is that Murkalot will occasionally cast Shieldstorm, which puts up a shield on all the pets on the team to absorb the next hit they take. Just be cognizant enough of this to not waste your Curse of Doom on that nonsense. When Murkimus finally enters the fight, our speed puts us at a bit of a disadvantage because of Counterstrike. Murkimus also has Heroic Leap, which functions like Lift-Off, Dive, etc. I like to swap to my carry pet during the first Heroic Leap, to eat that 500 or so damage. As such, I like to keep these carries to level 10 or higher. If possible, get a Curse Of Doom up before the first Heroic Leap to run out the clock more quickly. Alternately, this is another good place to use that Restless Shadeling’s dodge, if that’s the route you chose. 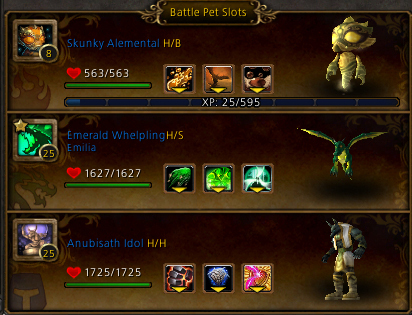 We’re kind of pet battling compadres & all, but having all those rare Blizzcon pets made me kind of excited to beat him. I guess this kind of makes me Best PVP Ogre NA 2014, right? This entry was posted in strategy, tamers and tagged elekk carry, strategy, Warlords of Draenor on October 13, 2014 by Liopleurodon. This is going to be the most intuitive, fool proof level one carry strat I’ve ever written, as well as the most tragically depressing. The first battle pet on my team has a decent heal. The second pet has some good offense and, preferably, a per-hit shield ability like Stoneskin. 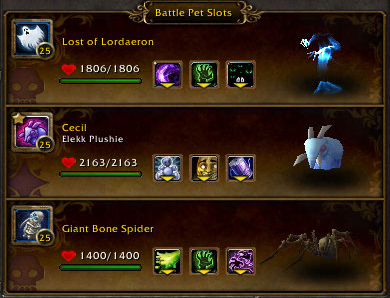 The middle pet is our level 1 carry. That’s really all there is to it. Note that I didn’t even specify the families involved, though you’ll generally want to steer clear of Flying and (especially) Critter type battle pets. 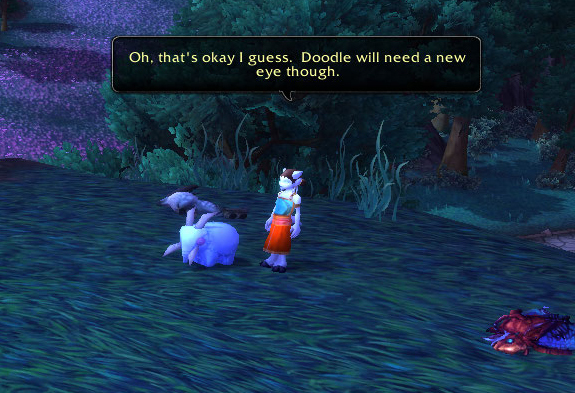 The reason this strategy is so simplistic and so sad is because of Ashlei’s middle pet, Doodle. It is similar to the new pet obtained through tailoring, the Elekk Plushie. The Elekk Plushie is a stuffed animal. All its attacks are fueled by the power of imagination, which means all Elekk Plushies do literally zero damage, including Doodle. However, the ability Nap Time will put Doodle to sleep for one turn and typical Tamer AI swaps pets which are stunned or slept, so you’re not quite safe to put in that level one for the carry when she first pops up. What I recommend is, after demolishing Pixiebell, taking a bit of time to heal up and refresh buffs, maybe get in a couple hits on Doodle. Then, when Tally enters you’ll be ready to go. The only thing to watch out for with Pixiebell is Life Exchange. I don’t really bother healing a lot before Pixie uses it, but I do keep up my defensive abilities, if possible. The longer this section of the fight goes the harder Pixiebell will hit with Arcane Blast, so the quicker you can kill her the better. Tally has Stampede and will usually follow that up with the hard-hitting ability Headbutt. This is why it’s preferable that at least one of your battle pets have that per-hit shield. Without the Shattered Defenses buff, Headbutt hits for 500 damage or so. If Tally gets Stampede off, its Headbutt will hit for 900 or more, which means curtains for most pets. After Tally dies, Ashlei will swap her plushie back in. At this point, as long as you have one living pet capable of doing any damage at all you win. This is also how a level 1 carry is accomplished easily: I wait until this second appearance of the plush, then swap in my level 1 for as many turns as I’d like before finishing the job. I’ve been able to solo this fight fairly handily with both my usual standby Emperor Crab and the Moonshell Crab I tamed on the eastern coast of Shadowmoon Valley. 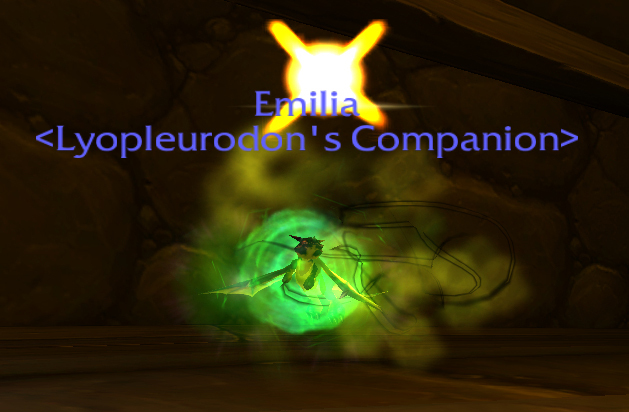 Many typically recommended utility pets like the Anubisath Idol or the Emerald Proto-Whelp do well here, too. The real challenge is crushing a little kid’s dream. I hope you’re proud of yourself, monster. This entry was posted in strategy, tamers, Uncategorized and tagged tamer, WoD, WoD Beta on September 5, 2014 by Liopleurodon. 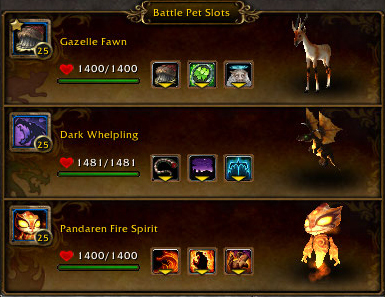 There are a great number of Tamers in Pandaria you can fight with your battle pets every day. They all provide a really excellent training ground for your low level pets, as well as a way to hone your skills to take on your next pet battling challenge. Here’s list of the strategies I used to easily beat these tamers. Level 1 carry strategies are noted with an asterisk. *Hyuna Of The Shrines – The Jade Forest, at an overlook above Yu’lon’s Jade Statue, is where this Pandaren makes her stand. Farmer Nishi – Buffed relatively recently, Nishi’s battle pets are all references to the pastoral nature of the Valley Of The Four Winds. Mo’ruk – The only Tamer in Pandaria without a florid title, his view on the beach in the extreme south of the Krasarang Wilds makes up for it. Courageous Yon – A bit of a hike to the top of Kota Peak in Kun-Lai Summit brings you face to face with this elusive tamer. *Seeker Zusshi – Near the Temple of Niuzao in the Townlong Steppes, you can visit this tamer on your way to get some super sweet, not at all outdated, Valor gear. Wastewalker Shu – Beside the heart of the Mantid Empire in Klaxxi’vess is where Shu (absolutely perplexingly) insists on testing your mettle. 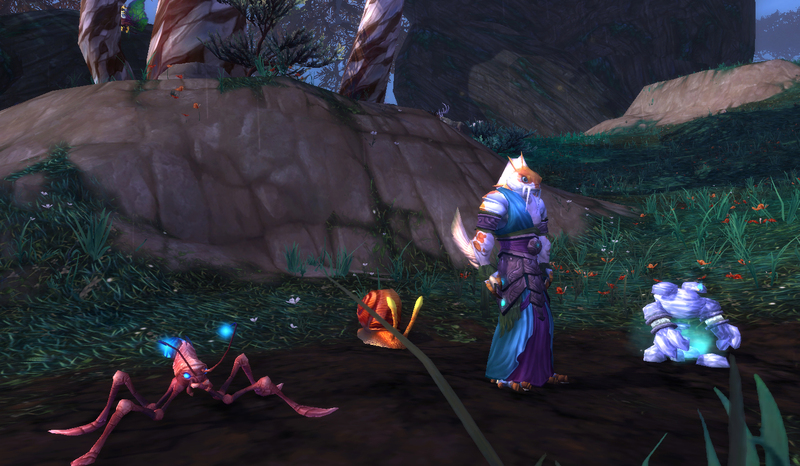 *Aki The Chosen – The ultimate challenge for your battle pets when we first came to Pandaria. 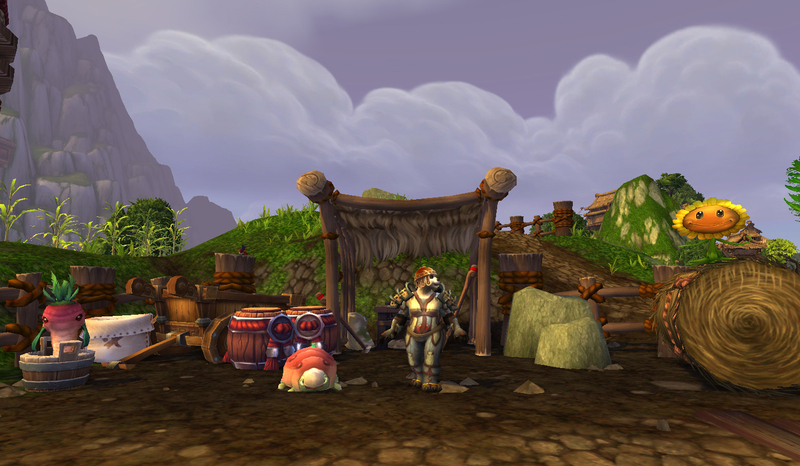 With the destruction wrought by Garrosh in patch 5.4, Aki now resides in Mistfall Village. The Pandaren Spirit Tamers were first added to World of Warcraft as a new challenge for pet battlers in patch 5.1. 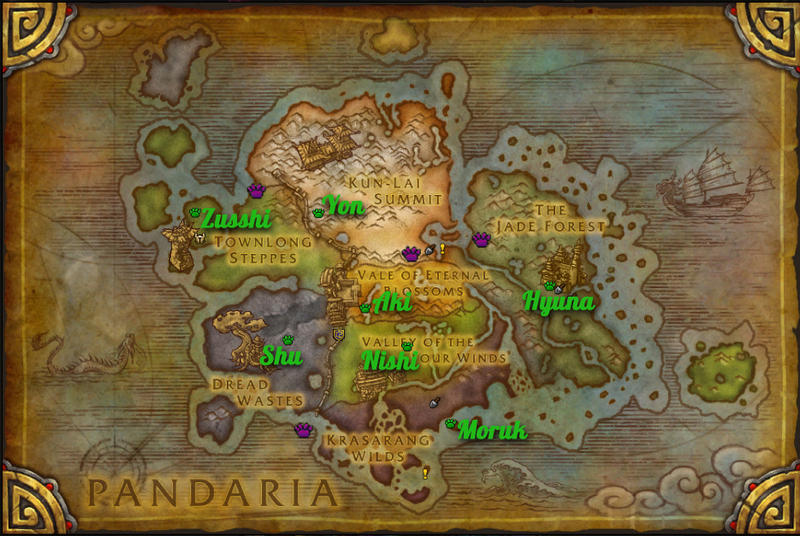 Each lives in a far-flung part of Pandaria. Each is a representation of an element, and each has its own separate guide, featuring a video. Flowing Pandaren Spirit Tamer – Near water, using aquatic battle pets, is where this tamer lurks. Whispering Pandaren Spirit Tamer – This tamer is high above the clouds and uses a lot of native Flying battle pets. Burning Pandaren Spirit Tamer – Replenished by a steady supply of Yaungol Oil, this tamer combines Dragonkin fire and wind to burn bright. 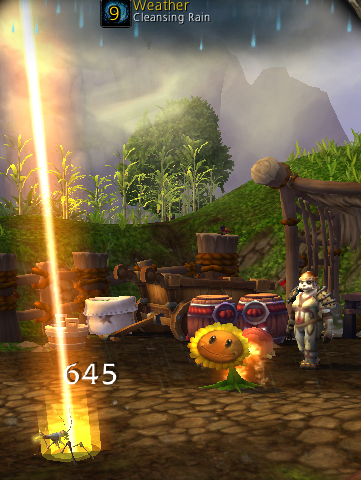 Thundering Pandaren Spirit Tamer – Near the seat of the Mogu, this tamer uses earth and magic to great effect. This entry was posted in checklists, strategy, tamers, video and tagged carry, daily, strategy, tamers on March 4, 2014 by Liopleurodon. The Anubisath Idol is fairly indispensable here because of his Sandstorm/Deflection combo. To carry a level 1 Sandstorm is really key, but if you’re going for level 10 or higher carries, or just beating the encounter the first time around, most pets with a decent heal will work pretty well in the first slot. My trusty crab Ishmael is of course a good pick, but I’ve also used frogs and my Perky Pug Bertha for this too. The carry pet is in the middle slot, and the anchor is a Flying battle pet, preferably with some kind of avoidance move. Moths with Cocoon and fliers with Lift-Off work really well, but another option is to go glass cannon, with something like a Gilnean Raven. First up is Diamond, and he’s the reason we’re packing the Anubisath. He uses Howling Blast, which does an AOE on all your pets as long as your front battle pet is Chilled. This is why Sandstorm is key if you’re trying to carry a level 1 battle pet. Occasionally my back row will take 10-20 damage if there’s an elemental-weak Mechanical, but other than that Sandstorm will block all damage from that AoE. After you’ve sorted that, Diamond just needs to be burned down. Mollus is a Rapana Whelk with the Acidic Goo/Dive combo we’ve seen before, and Absorb. The thing here is that Absorb’s reflexive heal will make the battle drag on a bit while Dive makes for big damage, which is why I highly recommended either a pet with a heal or a big dodge in this slot. To be clear, because of the mechanics of Dive, an ability with a similar mechanic will only result in your battle pet taking damage. Avoid that Dive when you can and get those hits in otherwise and you’ll dispatch Mollus handily. Skimmer always leads off with the same combo, and this is why you can carry a level 1 pet. He’ll self-heal and apply weather, then use Soothe, and then charge his Pump before releasing it on his fourth turn. Because Pump is the only offense he has, and he dawdles before actually unleashing it, this makes his offense both easy to counter and easy to use for a level 1 carry. 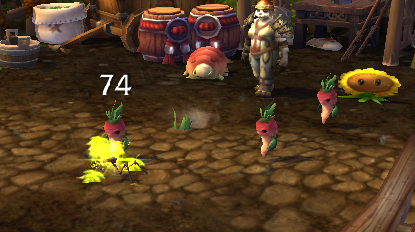 I usually swap my leveling pet in as soon as Mollus dies, regardless of whether my first pet is healthy, active, whatever, to take advantage of this first downtime, because after the first go around it gets a bit less predictable with the various ability cooldowns. From there, just try to avoid Pump when you can and burn Skimmer down. It has been quite a journey, through all the daily Tamer pet battles in Pandaria, so it’s fitting we end in the ever-glowing twilight of the Townlong Steppes. 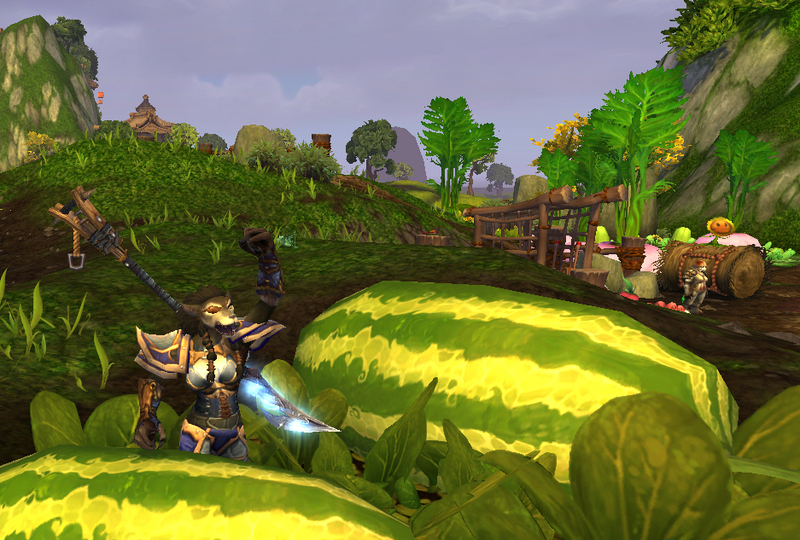 From here, it’s almost possible to forget that we, the players, in our travels through Pandaria, ruined Hyuna’s view, that we had a hand in polluting Moruk’s water, and that the vegetables surrounding Nishi will no longer grow enough to feed the Heartland so all the farmers will starve. Just don’t tell Zusshi he’s one of a handful of Jinyu left. It’s extremely likely that all his friends & family are dead. (edit) – This strategy works perfectly well as an Elekk Carry for your Awfully Big Adventure too. This entry was posted in strategy, tamers and tagged daily, Grand Master Tamer, powerlevel, strategy, tamer, tamers on March 4, 2014 by Liopleurodon. 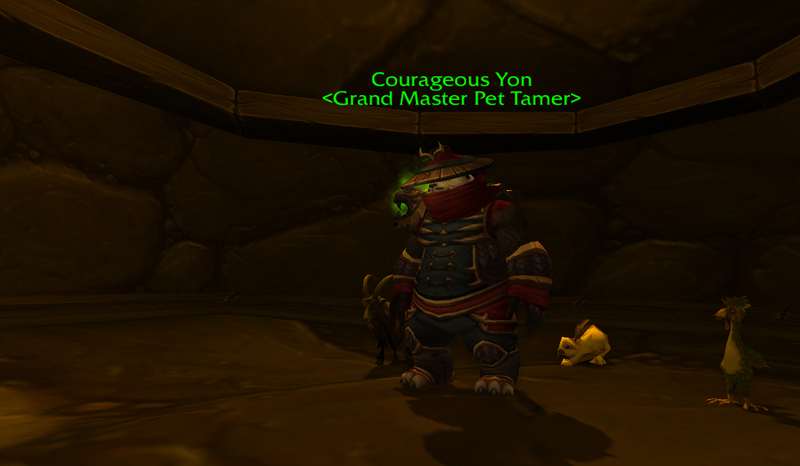 Now that Nishi has received a bit of a buff, this tamer is the easiest to beat among the Pandaren tamers, as long as you know his one really easy counter. Seriously, the hardest thing about Yon is finding his cave. Just look for the gnome corpses near the top of Kota Peak in Kun-Lai Summit. Kind of a macabre marker, but whatever works. Now, just because this tamer is stone-cold stupid easy doesn’t mean I’m going to get all pithy or anything. I mean, I still gotta do me, right? This isn’t the only team I use against Courageous Yon’s battle pets, but it does make for one of the faster victories. In practice, I usually just open my pet journal and pick out a couple battle pets with a shield ability. Any pet with some kind of shield ability will do. Anubisath Idol, Living Sandling, Feline Familiar, A turtle, a crab, Yu’la, whatever you’ve got. If you want to go with an Enchanted Broom with a Sandstorm that’ll work. I’ve beat him with a crab and a snail, intentionally placed off-family (Aquatic crab vs Flying Piqua; Critter snail vs Beast Bleat). Seriously, anything. Well, almost. A pet with Spiked Skin won’t work here. Once you put up that shield, there’s only one ability to sort of look out for with Yon’s first pet Piqua, and that’s Lift-Off. It hits fairly hard, and that’s about it. It could be far worse, as Piqua will apply Shattered Defenses with Flock, and then turn and utterly destroy your pet. If you’re able to completely absorb all the ticks of Flock, Piqua won’t apply Shattered Defenses, hence the whole shielding ability thing. Spiked Skin doesn’t absorb the whole hit and so lets Shattered Defenses go up, which is why that won’t work. 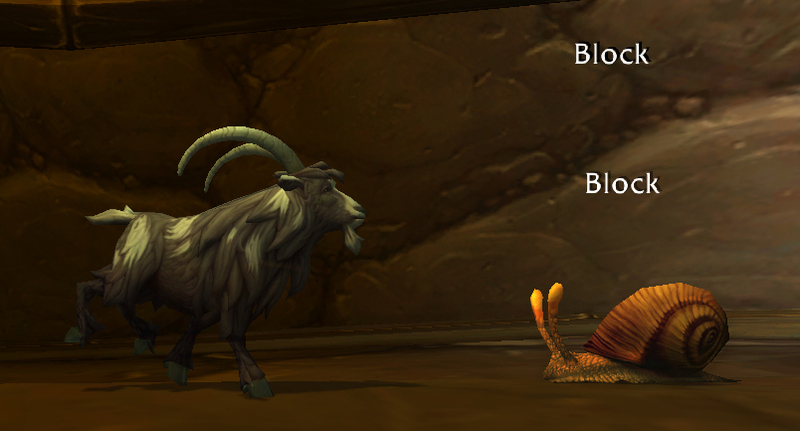 Yon’s third pet, Bleat, does the same kind of thing with a Stampede/Chew combo. Bleat also has a small heal, but nothing too big. 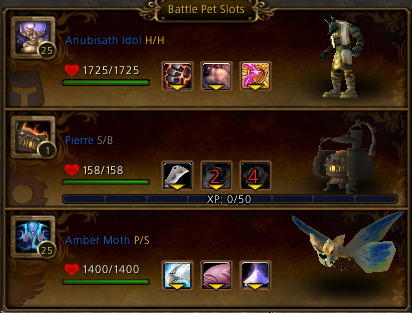 If you’re using battle pet with a burrow ability, or the Anubisath Idol with that impossibly overpowered Deflection move, try to avoid the big hit those 2 pets try to dish out because it’ll give you additional staying power. But that’s just icing. As long as you maintain that shield and just keep on keeping on you’ll beat this fight. Yon’s second pet, Lapin, follows a similar pattern. Though his Flurry won’t apply an additional debuff, it’s all small hits which can be mostly absorbed by a battle pet with a damage shield. He also uses the large hit Burrow, which should be dodged if possible. And that’s pretty much that. With a bit of thinking ahead, I’m frequently able to solo this battle, so it’s possible to carry more than one pet. The Anubisath Idol is suited well to this, but the Emerald Whelpling is a good pick for this too. 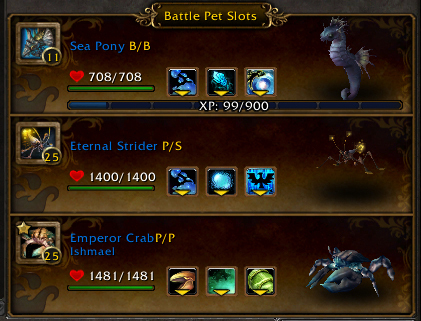 The thing is, if you carry 2 battle pets you split the earned XP between them. 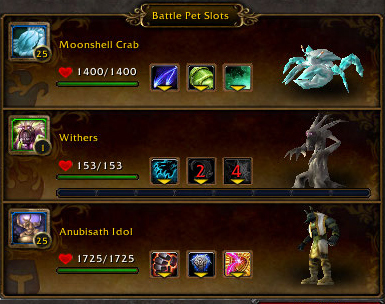 Instead of just one battle pet getting ~4K XP with 2 level 25 ringers (depending on the level of the carry), you’ll have two battle pets getting ~2K XP each. To me, it’s far more worth it to just carry the one instead of doing two, but I’m putting the information out there just in case you’d like to rebel against the machine or whatever it is you whippersnappers are doing these days. For the video walkthrough, I did something a little different. Rather than use the team I picked for the guide on the blog, I went to a part of the Dread Wastes I knew was crawling with snails and crabs, tamed 3 of them, and then went to beat up Yon. I didn’t use a carry pet for the video, just to give myself an extra buffer. This is just to show you that you don’t need any special pets for this, and for real, all you need is shield abilities and you’re good to go. Because this doesn’t show the carry, I’m going to add that it’s best to just put your carry in first thing, and use a lvl 5+ battle pet. This entry was posted in strategy, tamers and tagged daily, pandaria, strategy, tamer, tamers on February 4, 2014 by Liopleurodon. This entry was posted in tamers, Uncategorized and tagged featured, pet battles, roundup, spirit tamers, world of warcraft, wow on October 26, 2013 by Liopleurodon. 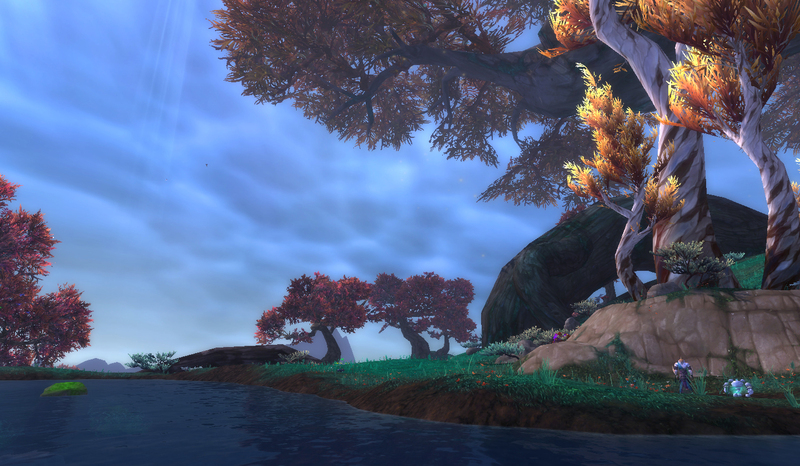 I thought all my walkthroughs on the Timeless Isle were complete. I kicked back with a well-earned chocolate chip cookie and waited for the patch. I was excited to get my mini Xuen, run around in the Shrine of Seven Stars for a while showing it off, and make a small fortune on new glyphs. Then, I see this jerk. Look at that smug little face. I’m guessing that the trigger to seeing his daily is something along the lines of defeating Aki, but I’m really not sure. I’d heard occasional discussion about him during PTR, but never saw that he had anything for me, so I kind of ignored him. I’m kicking myself over this now, trust. Tommy Newcomer only has one pet. So we should totally take pity on him, right? 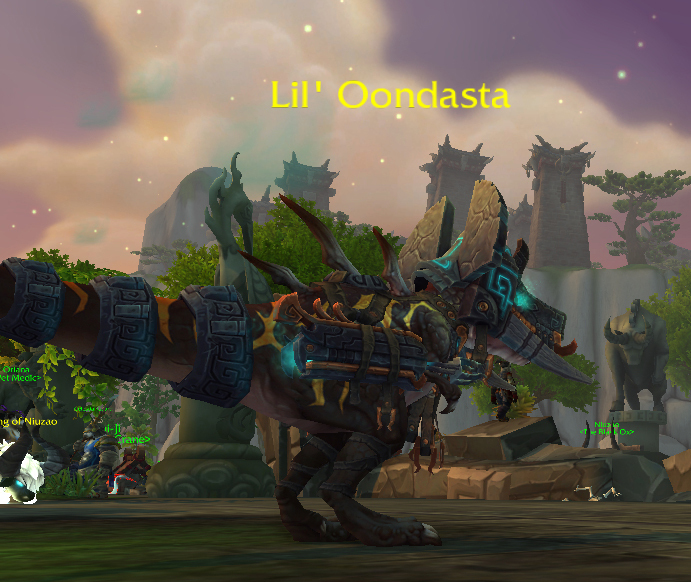 Lil Oondasta is the pet equivalent of, well, boss Oondasta. With a very strong AOE and a force swap, she is a brutal fight. Luckily, she’s only one mob, and you can heal and re-try as many times as you need to get her down. For 500 Timeless Coins and 20g. Ugh. 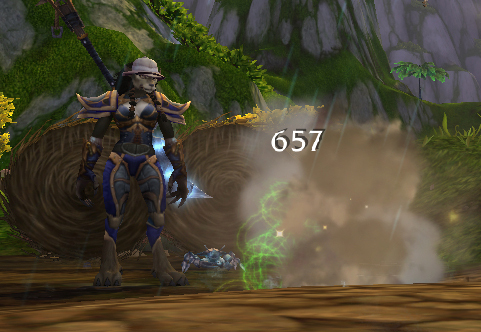 Oondasta has 3 abilities, and her 2 most deadly are Magic: Frill Blast (force swap) and Spiritfire Beam (the AoE). She backs that up with Crush, which is a big hit in itself. 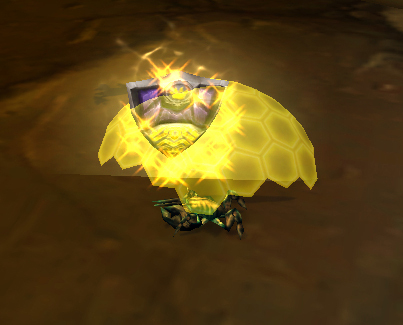 Because of the humanoid nature of Crush, trying to use my Golden Hatchling in concert with the Clockwork Gnome was met with a hearty ‘lol u mad’ from Oondasta. 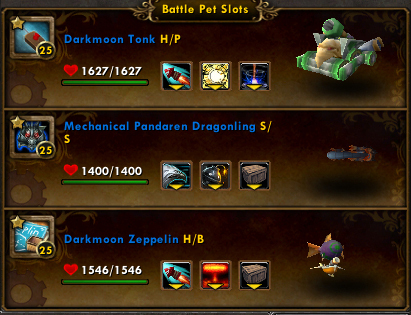 The reason I like the Zeppelin and the Mechanical Dragonling should be fairly obvious. Decoy is an amazing ability this fight, and I want to abuse it as much as possible. I definitely screwed up a bit on the Dragonling’s moveset though… Frill Blast will always swap in the Zeppelin for me, because of the higher health, so unless I manually swap for a Fly By, I’m not going to use it to buff others, and the Dragonling doesn’t really have other moves to buff itself. Though there’s not a ton of damage we have to do, the breath ability will probably make for a cleaner fight. The reason I go with the Tonk is that, because of the force swap if I use Ion Cannon off the bat, Oondasta will then immediately swap him to the back row for the recharge turn and the vast majority of the cooldown I have before I can cast it again. If I return to the front row on my pre-res turn, I can also get in a Shock and Awe for a hopeful-maybe stun. 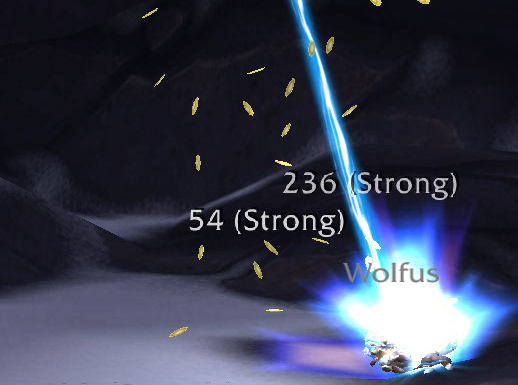 Oondasta is slower than all my pets and only has single hits, so once she kills my mechanicals the first time, they’re guaranteed at least one extra hit. As long as they don’t die in the back row, anyway. I really liked using two Decoys. I don’t think that both are entirely necessary, especially given the relatively paltry firepower on the Dragonling. Explode as a mechanic is a really excellent tool for single fights, so I would definitely recommend using at least one of these pets. The Tonk is a little more debatable. 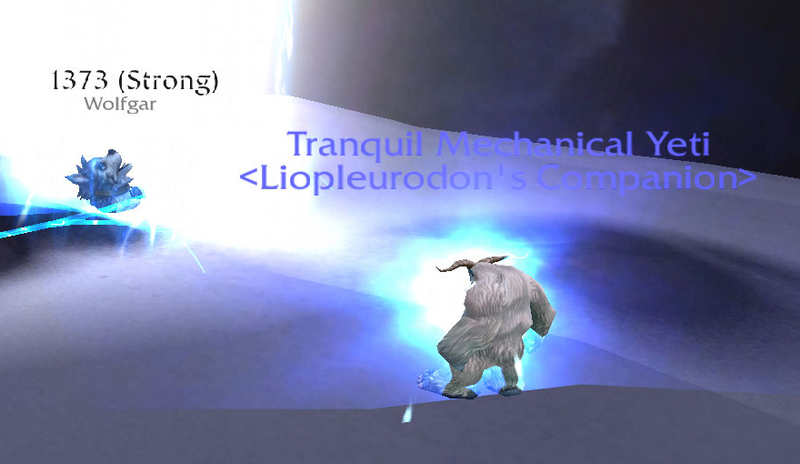 You can definitely try subbing in either the Menagerie Custodian or the Tranquil Mechanical Yeti, both of which use Ion Cannon. They’re a bit less sturdy, but it’s still an option. If you go with the Yeti, you may want to opt for Thunderstorm instead, and pair it with a Clockwork Gnome’s turret. In general, as long as you have a good amount of mechanical offense and aren’t caught off-guard by the force swap, you’re going to be in good shape. A final note: I don’t like writing strategies with pets which are prohibitively expensive or difficult to get without at least offering a solid alternative (eg, Emerald Proto-Drake can be substituted for the Emerald Whelpling in most settings). With that in mind, the Son of Animus, specifically Interrupting Jolt, really shines this fight in place of the Tonk. I want to stress that this investment isn’t necessary, but I can generally keep that last pet alive entirely (well, minus an AoE or two) if I use Animus here. This entry was posted in strategy, tamers, video and tagged 5.4, dinosaurs, lil oondasta, strategy, tamers, video on September 12, 2013 by Liopleurodon.